Well, in honor of Sugar Addiction Awareness Day, I have joined a chorus of voices who are speaking on sugar and its dangers. On this blog, I decided to discuss sugar as well as other various sweeteners. I just wanted to give you all a bit of information on these. It seems to me that many people are confused by them. Also, just at the end of this blog, I am including information about how to get help to get off of sugar. These are just some suggestions, but there are plenty out there! I hope that you will take this information seriously. 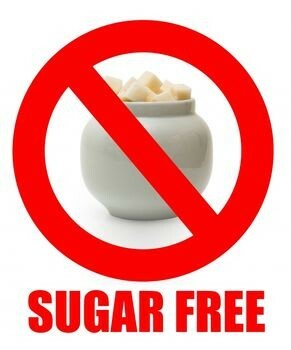 I firmly believe that sugar is addictive and should be out of the diet! One more thing: Usually, I post all references in the blogs and go into great detail, but it has been a really hectic month, and today is no exception. I will try to post another blog on this at some point, and include all the references, but I wanted to post this today because it is Sugar Addiction Awareness Day! I hope you enjoy it! It's not just sucrose you should look out for too! Sucrose: This sweetener is known as table sugar to most. A molecule made up of glucose and fructose, it is a disaccharide (one of four chemical groupings of carbohydrates. The others are monosaccharide, oligosaccharide, and polysaccharide). There are, in my opinion, many issues with sugar. It does have a relatively high glycemic index of 64. This means it is quick to cause response in blood sugar in the body. When consumed, sucrose processes into glucose in the body. Sucrose is one of the sugars that can cause issues such as tooth decay, diabetes, obesity, and gout. Along with other carbohydrates, sucrose may well be one of the products we should definitely avoid! Agave Nectar: Agave is actually more harmful for the health than HFCS. It has a more concentrated level of fructose in it. Agave has 70-90% refined fructose in it. Compare that to the 55% refined fructose in sodas. It is almost all sugar and refined. HFCS: Leads to obesity by tricking the body into not releasing fat regulators insulin and leptin. Fructose, and in particular HFCS, increases blood pressure, triglycerides, and small dense LDLs. It also depletes the body of vitamins and minerals. HFCS seems to have been a factor that would lead to cardiovascular disease, cancer, liver disease, arthritis, and gout. Xylitol: A sugar alcohol that has been touted as healthy. It kills bacteria in the mouth. It can cause gas and other intestinal upsets. Honey: This is high in fructose. It has a glycemic index rating of 62. The positive about it is that if it is local, it could contain some allergy fighting pollens in your area. It does spike blood sugar. Maple Syrup: Less fructose in this than in honey. It is safer in small doses. Fructose is metabolized in the body differently than glucose. 100% of break-down of fructose relies on the liver. Compare that to 20% break-down for glucose. Fructose is turned into free fatty acids and stored as fat in the body. Compare that to the fact that glucose can be used by the body before storage. Fatty acids accumulate in the liver as fat droplets. This causes non-alcoholic fatty liver disease and insulin resistance. This leads to T2DM and obesity. Sugar can cause kidney stone formation. Sugar depletes the body of magnesium and B6, which makes it more likely to form kidney stones. Sweet N Low, Nutrasweet, and Equal: These are both Aspartame. 200 times sweeter than sugar. Causes fatigue, headaches, diarrhea, depression, insomnia, and memory problems. Is a neurotoxin. Toxic to the brain. You can kill ants with aspartame. Symptoms of using Aspartame can mimic MS.
Splenda: Sucralose. 600 times sweeter than sugar. Made by chemically altering it and adding chlorine to sugar to change the structure of the molecule. Side effects: Skin rashes, joint pain, heart palpitations, and sinus problems. Use of Splenda reduces the beneficial bacteria in the intestine and digestive system so the nutrients can’t be broken down for proper digestion. 95% of people drinking diet soda are at greater risk for metabolic syndrome. Stevia: 400 times sweeter than sugar and the best choice. Natural leaf that does not spike blood sugar. Good to go. Eurithrotol and Maltitol: Known as sugar alcohols, these are similar to Xylitol. Each sugar alcohol has a different scale of glycemic load and calorie count. They can be intestinally upsetting. Have a healthy day! Sorry if this blog is not nicely put together, but I’m in a bit of a rush today! This entry was posted in Action, American Diet, Aspartame, Chronic Illness, consumption, corn, Diabetes, endocrine system, Fat Loss, Goals and tagged addiction, adrenal, alternative, alternefit, carbohydrate, carbohydrates, carbs, Chronic Illness, corn, Diabetes, Diabetes Melitus, diet, eating, fat loss, food, Fructose, glucose, health, health and wellness, Healthy, lifestyle, low-carb, low-GI, low-GL, nutrition, obesity, paleo, primal, Reverse or Control, sucrose, sugar, sugar addiction, sweeteners, sweets, T2DM, Tips, Type 2 Diabetes, Type II Diabetes, weight loss, wellness. Bookmark the permalink. A few little notes to add. Another great resource for kicking sugar addiction is Diane Sanfilippo of Balanced Bites. She has a 21 day sugar detox! One thing I didn’t state about stevia: PLEASE, pay attention to what kind of stevia you are getting. The green, unprocessed kinds are the best. There are some good liquid drops that are okay too. I would stay away from the processed, white kind…it usually has maltodextrin in it…and it’s PROCESSED! Hope that helps a bit more! Quick, to the point and perfectly fine Rachel!! Always look forward to your posts!! Thanks for the info, Rach!! !